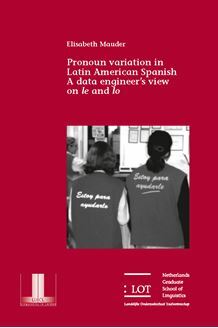 In Latin American Spanish, the pronouns le, la en lo represent remnants of the Latin Case system. Although most verbs govern case, there are contexts in which the pronouns appear in variation, e.g. in clauses based on verbs like ayudar ‘to help’. Earlier studies found support for the assumption that pronoun choice in such clauses is influenced by contextual elements, e.g. that the dative form le is pre­ferred when the subject of the clause is inanimate or when the pronoun appears in a politeness construction. This book aims to replicate these investigations under strict methodological conditions, including the application of multivariate techniques. The investigation comprises three parts: (i) a critical discussion and meta­analysis of earlier studies, (ii) a text­based study of pronoun use, and (iii) a large­scale experiment. The discussion of earlier publications reveals that many of them are ridden by methodological weaknesses and part of the reported results fail to survive statistical testing. Neither the text study nor the experiment yield convincing evidence for the effect of contextual factors. Overall, pronoun variation cannot sensibly be related to one single factor or a small set of factors. A possible explanation for the wide­spread belief in the impact of contextual factors on pronoun use is found in the investigation of contexts in which the pronoun is governed by the verb. These contexts show the predicted co­occurrence between dative pronouns and inanimate subjects, c.q. politeness constructions a distribution which is merely the result of the high frequency of dative­governing verbs in such contexts. The theoretical background of this study is a functional approach known as Columbia School, yet due to the strongly data­oriented and methodological focus, the book is also accessible to, and useful for, specialists working in other theoretical frameworks or on other problems of linguistic variation.